A beautiful green and a lush tropical forest is the wonderful setting of this Next Gen Gaming powered slot machine. The game has 50 paylines, 5 reels and a lot of greatly rewarding features. The game is developed through a co-operation between Next Gen Gaming and GamesLab. This results in a highly entertaining and a fun game that is like none other. The slot machine that takes players to the jungle for a great experience as they search for the great fortunes and treasures that the jungle has, especially the Diamond Jewel. The game is playable from 0.50 credits and it can be enjoyed by players on a wide variety of platforms and devices. This includes tablets, smart phones, PCs and laptops. The game, as apparent from its title, takes players on a great jungle themed ride. Players will enjoy multiple shades of green that dominate the visual style of the game. This is not a surprise since the game is located in the jungle. 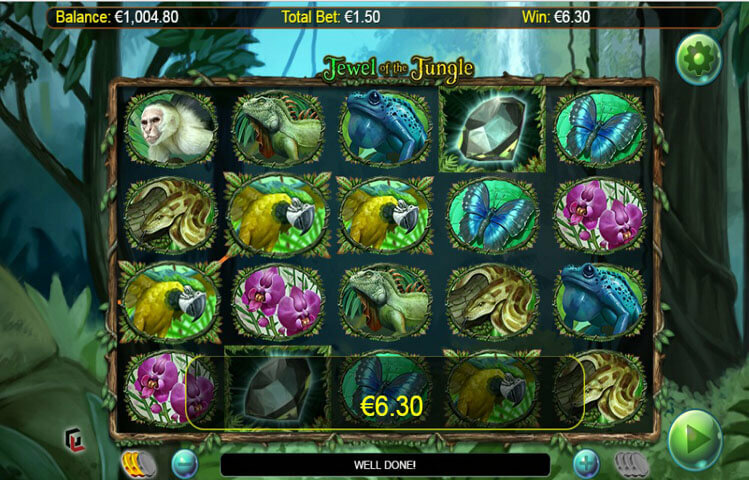 Players will try to locate the jungle treasure and claim its jewels as their own, whether through the fifty wager lines of the game or the game’s special features and icons. The symbols that are going to be landing across the reels of the game, they include parrots, lizards, monkeys and more. There is also the diamond icon, butterfly and frogs. All of the icons come in great quality visuals that would immerse players into theme of the game. The game comes packing a lot of special icons and features that makes sure the players’ stay at the game is rewarding. For starters, there is the diamond wild icon. It can appear grouped to give players great rewards on reels 2, 3, 4 and 5. It would replace all icons except the scatter. The scatter icon is the waterfall icons. This icon can trigger the free games feature when players get 3, 4 or 5 scatters. They can claim 10, 15 or 20 free spins. Players can claim more free spins during the free spins round.